On this week's edition of the Official Adventures in Odyssey Podcast, hosts Bob and Jesse interview sound designer Nathan Jones about working on the recent Album 66 episode B-TV: Trinity. Nathan talks about how the soundscape of a B-TV show differs quite a bit in style from a normal AIO show, the difference between Foley and sound effects, searching sound effects libraries, and working with composer John Campbell. They also discuss putting together all the sound effects for the submarine, the importance of reverb in each scene, as well as the upcoming AIO club episode B-TV: Idolatry. Plus, we hear a preview of The Long End, Part 2, which airs this Saturday. Check out the podcast interview. Renee D. Carter, named after famed philosopher Rene Descartes, is a new character on Adventures in Odyssey. She's a Campbell College student interning at Whit's End and she's already appeared in eight AIO Club episodes. She's definitely a great addition to the world of Odyssey, but she has yet to appear in the regular albums. But does that really matter? Do non-club listeners need to hear from Renee as well? We address these and other questions in our new editorial entitled The Case of the Missing Carter. Is Rene an important character? Check out our thoughts on the character of Renee Carter and then let us know your opinion in the comments below. Unfortunately, a number of the Album 67 episode titles and descriptions we posted on April 6th were incorrect. They were the result of an old April Fool's Day prank on another site, which made its way to the AIOWiki. Sorry for the confusion. We now have the corrected list of episodes in Album 67: More Than Meets the Eye. You'll notice that a few of the episode titles are the same as before, while others have been changed. Rightly Divided: Pastor Knox becomes concerned about Camilla’s fiery prayer for her soccer team’s victory and Declan consults Lou for advice on dealing with a bully at school. Man of the House: Wyatt takes it upon himself to start fixing things around the house – including a washing machine. Meanwhile, David decides that it’s time to take Matthew on a camping trip to teach him to be a man. Page from the Playbook: As the Odyssey High School Football team heads toward the state championship, wide receiver Buck Oliver and quarterback Cooper Calhoun have to deal with unexpected challenges from Jay Smouse – who’s trying to sell team memorabilia – and their new assistant coach… Eugene Meltsner. A Sacrificial Escape: Emily and Matthew are trapped inside an unfinished escape room in the basement of Whit’s End. A mysterious voice insists that the two of them must play a game called “Search for Your Life” to get out. Nightmares by Constance, Part 1: Two days before a Dreams By Constance wedding, the grandmother of the bride approaches Connie with a proposal. She'll pay her double if she breaks up the ceremony. Nightmares by Constance, Part 2: Connie, Jason, Jillian, and Detective Polehaus continue their investigation of the suspicious groom and discover that his – and the whole family’s – past is more complicated than they could have imagined. ​Album 67 comes out on the AIO Club this summer, and on CD and digital download this fall. After that, it will air on the radio and on whitsend.org. Voice actor Aria Curzon, who played Mandy Straussberg on Adventures in Odyssey, is currently working on her debut musical album. But she needs your help to do it. Aria has set up a GoFundMe page to spread the word and get backing for her project. Here's how Aria describes the upcoming album: "It's my number one mission in life to help others who battle depression, anxiety, and all other kinds of mental/enotional unrest, with a musical statement that spreads an infectious level of peace, joy, and beauty. I want you to be able to play my album, and feel like a smile is spreading through your soul. My goal is to take my favorite selections from the genres I have the highest affinity for (Musical Theatre, Americana, Gospel, Jazz) and finally use the gifts I do have to sprinkle a little more happiness into this world." The album's release date is set for March 2020. But it may not happen unless it gets funded. There are different rewards for various funding levels. For example, if you donate at least $7 you'll get the album as a digital download when it comes out. Donate $750 and you'll get to sing a duet with Aria herself. Head over to the GoFundMe page to contribute to this project. Focus on the Family is offering something special to fans of Adventures in Odyssey this summer. If you're a U.S. resident, you and your family have the chance to win an all expenses paid trip to Colorado Springs, Colorado from June 20th to 23rd. That includes the cost of airfare, hotel accommodations for three nights, a car rental, and meals. Plus, you'll get a VIP behind-the-scenes tour with Adventures in Odyssey producer Nathan Hoobler, a luncheon with the AIO team, and much more. The deadline to enter is Friday, April 26th. You can enter once a day to increase your opportunity to win. Phil Lollar, Paul McCusker, Kathy Buchanan, Nathan Hoobler, Bob Hoose, Marshal Younger. These are the names of writers that we frequently hear mentioned in the credits at the end of every Adventures in Odyssey episode. How would you like to have your own name in the credits one day? Adventures in Odyssey is currently looking to hire a new writer apprentice. It is a paid position and would require you moving to Colorado Springs. This apprentice will learn and develop the ability to write original scripts for the show and continue the legacy of over thirty years of excellence in audio drama. The apprentice will become immersed in the world of Odyssey, learning more about the show’s history, characters, locations, and storylines. He or she will also provide input on story ideas, outlines and scripts as well as gaining an understanding of our target audience through extensive reading, personal contact, research, involvement with social media, and message boards. Check out the details. On the latest edition of the Official Adventures in Odyssey Podcast, hosts Bob and Jesse interview actor Monica Padilla, the voice of Jillian Marshall. She talks about her audition alongside the voice of Jason Whittaker, dealing with nervousness, journaling every day, and the importance of chemistry in the studio. Monica also discusses a challenging scene, reading the script beforehand, acting in the moment, working with director Kathy Buchanan, appearing multiple times on the reality TV show Survivor, acting in the Album 67 episode Nightmares by Constance, and more. Check out the podcast interview. Adventures in Odyssey is airing new episodes on the radio once again. The first episode of Album 66: Trial by Fire, titled Much Ado About Jealousy, is available to listen to online at whitsend.org for free. In this episode Jules Kendall starts turning to her new roommate Jillian for advice and Connie worries that her close relationship with her sister is being snatched away. Over the next six weeks all the episodes in Album 66 will be airing. Here's the album summary: "After years of searching for his true identity, Buck Oliver may finally get some answers. But along with clues about his family, he also is subjected to the dangers of his past. Buck’s old mentor Mr. Skint arrives in town with an offer that would take Buck away from Odyssey for good. Elsewhere, Connie feels unappreciated when Jules starts looking up to new roommate Jillian more than her own sister. And the crew at B-TV chart a course deep into the ocean to learn more about the concept of the Trinity. 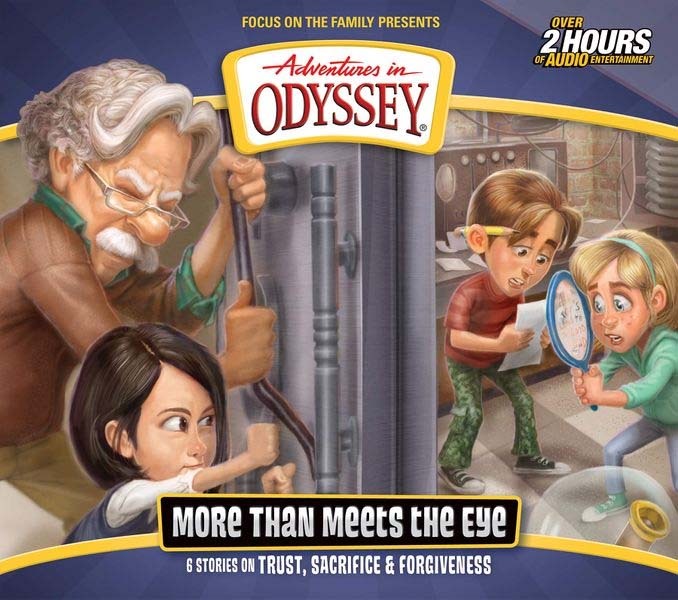 Dramatic conclusions and fresh beginnings abound in these six entertaining and inspiring adventures in Odyssey!" Make sure to check back at whitsend.org every Saturday to listen to a new episode. And remember that each episode will only be available for free online for seven days. Writer and director Marshal Younger's first episode of Adventures in Odyssey was The Living Nativity (Album 16) and has gone on to write over 150 episodes of the show. On this week's edition of the Official Podcast hosts Bob and Jesse do an interview with Marshal, who wrote and directed the new AIO Club episodes Between Camp and a Hard Place, Parts 1 and 2. He discusses the research that went into the show, the storylines included, and the main focus of these camp episodes. Marshal also talks about some earlier rough drafts, the various challenges the characters go through, casting the actors, the three-act structure, getting back in the studio, and much more. Check out the podcast interview. Every once in a while we like to take the time to highlight one of Focus on the Family's popular Radio Theatre productions. From The Chronicles of Narnia to Anne of Green Gables, these top quality dramas have become a staple in Christian homes. Today we're looking at a story that has been enjoyed by readers for nearly two hundred years. The classic tale Oliver Twist, by Charles Dickens, was first published in short installments, beginning in 1837 and finishing in 1839. The audio adaptation promises to draw listeners into this timeless drama of compassion, corruption and redemption as a single orphan changes the lives of everyone around him. As always, this production features cinema-quality sound, award-winning writers, an original music score, and a stellar cast of some of England's best actors. It's definitely a worthwhile listen for the whole family. Whether you're going on a road trip or just tidying up at home, this 5-CD dramatization will give you hours of wholesome and uplifting entertainment. You can purchase Oliver Twist today as either a CD set or a digital download. 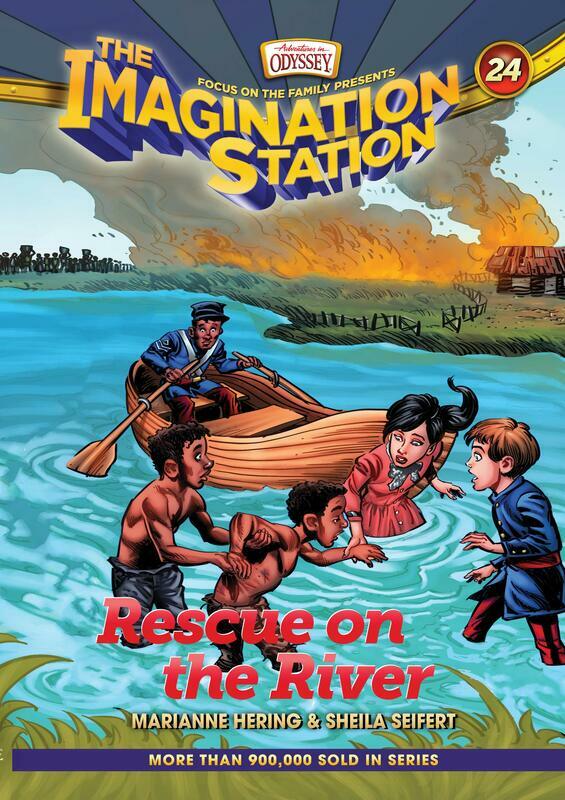 The Imagination Station book series is targeted at younger readers and features adventures to all kinds of exciting places throughout history, from the story of David and Goliath to Nazi Germany's occupation of Holland in World War II. Recently the writers have been developing a three-part story arc set during the American Civil War. The first two books are already available in stores. It all begins with Freedom at the Falls, which features our main characters Patrick and Beth as they help conduct escaping slaves along the Underground Railroad to freedom. In the sequel, Terror in the Tunnel, a band of assassins plan to meet Lincoln in Baltimore and end his presidency before it starts. The three-part story arc will conclude with the book Rescue on the River. Here's the summary: "Cousins Patrick and Beth attend Abraham Lincoln’s inauguration and discover that their friend’s brother Kitch is a slave in South Carolina. The cousins search for Kitch as they travel down the Combahee River with Harriet Tubman. They help with the secret mission of the Second South Carolina Volunteers, an African American unit. Will they be able to find and rescue Kitch?" The book comes out in October of this year. 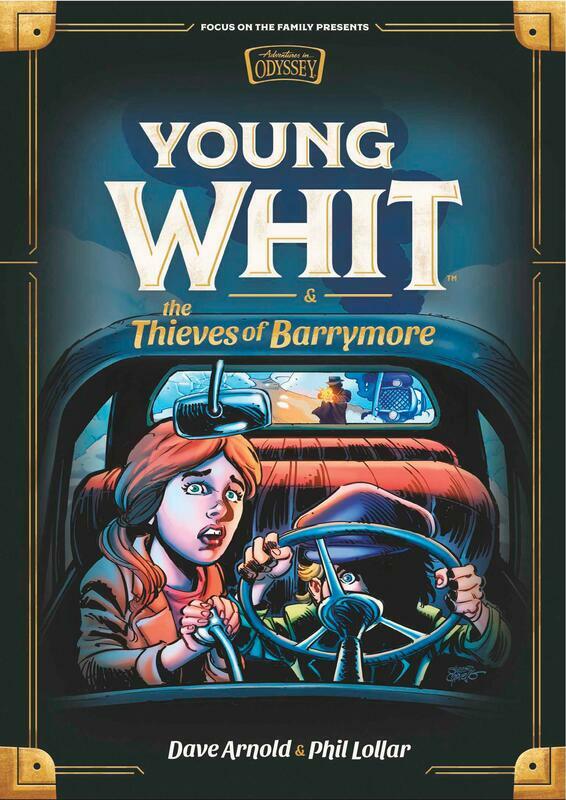 The Young Whit book series, written by experienced Adventures in Odyssey veterans Phil Lollar and Dave Arnold, explores the past of the show's main character, John Avery Whittaker. And it's definitely a wild ride. Book One, The Traitor's Treasure, features a ten-year-old Johnny Whittaker who finds himself in a mystery of missing Confederate gold and the question of whether Johnny’s ancestor was the coward and thief who stole it, as everyone believes. Book Two, The Shroud of Secrecy, comes out this April and involves a mystery surrounding a supposedly haunted mansion. And now we know the title of the third book in the series, ​The Thieves of Barrymore. Here's the summary: "Johnny’s family adjusts to his stepmother Fiona’s blindness due to a riding accident. Johnny and his father, Harold, also discover more about the old journal and the mysterious cloth that seems to heal people miraculously. Meanwhile, Johnny and his friend Emmy investigate as mysterious strangers move into town. Are the strangers planning to rob the town’s bank?" The book will be released in November. 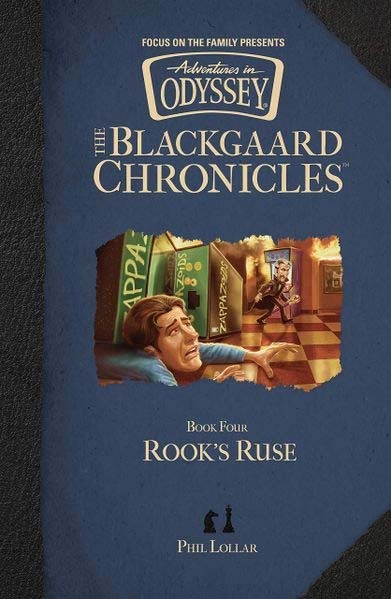 The Blackgaard Chronicles is a new book series from Adventures in Odyssey. It retells the saga of Dr. Regis Blackgaard and his cronies with new scenes and never-before-revealed drama. First came the book Opening Moves, which covers the beginning of Blackgaard's escapades in the town of Odyssey, while the sequel Pawn's Play covers the events of the episodes Connie Goes to Camp and Eugene's Dilemma. And just next month the third book in the series, Cross-Check, will be released. It is based on the two-part episode The Nemesis. And now we have more information about the next addition, titled Rook's Ruse. The cover art has been unveiled, thanks to the AIOWiki. It features the character Richard Maxwell trapped at Blackgaard's Castle. The book will be released later this fall and covers the two-part episode The Battle, the epic conclusion to Album 5. Phil Lollar, the writer of the series, promises plenty of surprises along the way. On the latest edition of the Adventures in Odyssey Official Podcast we hear from the cast of the new AIO Club episode which takes place at Camp What-A-Nut. The two-part show is titled Between Camp and a Hard Place. Actors Brianna Bryon, the voice of Scarlett, and Rachel Eggleston, the voice of Elise, join Bob and Jesse for an interview. They talk about their own experiences at summer camp, how they first got into acting, how voice recording for a cartoon compares to Odyssey, the hardest thing about being an actor, and competing for roles. They also discuss how they're similar and different to their characters, working with writer and director Marshal Younger, and much more. Check out the podcast interview. It was just a month ago that we learned the title of Album 67, More Than Meets the Eye. Today we have more news. The cover art for the album was recently posted on Amazon. Thanks to the AIOWiki for the update. The album includes six episodes on trust, sacrifice, and forgiveness. So far we know two potential episode titles: A Sacrificial Escape, as well as a musical episode called Icky, Kat, Balty, and Bones. Plus, the album summary has also been revealed: ​"Mystery and intrigue abound as Emily and Matthew are trapped inside an unfinished escape room in the basement of Whit’s End. Meanwhile, the Odyssey High School Football team heads toward the state championship and deals with unexpected challenges. "​ Album 67: More Than Meets the Eye is expected to be released on the AIO Club in July of this year and then come out via digital download, CD, and radio airings this fall. Fantasy stories such as C.S. Lewis's classic The Lion, the Witch and the Wardrobe are celebrated in Christian homes because of their ability to present biblical truth in a new light. Believe it or not, Adventures in Odyssey has its own fantasy series where kids from Odyssey are swept up into the world of Marus. Does Marus really exist or not? That's all part of the mystery. The series is called Passages and all the novels are now available for sale in two sets: Volume 1 and Volume 2. In 2009 the first Passages novel, Darien's Rise, was adapted as an audio drama on 3 CDs. These were the first Adventures in Odyssey episodes to feature the new voice of Mr. Whittaker, Andre Stojka. Should the rest of the novels finally be adapted after ten years of waiting? It seems about time. In the latest editorial from the AIO Update, entitled In a Kingdom Nearby, we discuss one possible way to revive the Passages series. Perhaps you have some ideas of your own too. Check out this editorial and then join the conversation in the comments section. This month brought the episode In a Sun-Scorched Land, Part 2, to the AIO Club, the epic conclusion to Adventures in Odyssey's powerful adventure in South Africa. On this week's edition of the Official Podcast, hosts Bob and Jesse interview writer Kathy Buchanan and sound designer Christopher Diehl all about what went on behind-the-scenes in the creation of this episode. Kathy talks about the tragic true story that inspired it, travelling to Africa in person, the theme of persevering through times of suffering, and challenges in the recording studio. Christopher discusses looking over the script ahead of time, keeping an eye on characters' accents, actors ad-libbing, and much more. Check out the podcast interview. Album 66: Trial by Fire hasn't aired on the radio yet. That'll happen next month, along with the CD release. But now the digital download of the album is finally available on iTunes, and you know what that means. As of today you can now hear a 30-second preview of each episode on the album, from Much Ado About Jealousy to The Long End, Parts 1-3. Plus, there's a deleted scene you can preview as well. The album features the next exciting installment in Buck Oliver's adventures, so if you're wary about spoilers you may want to stay away for now. But if you can't wait, you may as well purchase the download for $9.99. Check out the episode previews on iTunes. John Avery Whittaker is Adventures in Odyssey's main character. We know him today as a wise, grandfatherly inventor and ice cream shop owner. But what was he like as a kid? In a new book series called Young Whit we get to hear more about all of little Johnny's childhood adventures. The first book in the series, The Traitor's Treasure, is already available in stores. The mystery in this first book involves Confederate gold missing since the end of the Civil War and the question of whether Johnny’s ancestor was the coward and thief who stole it, as everyone believes. The sequel, The Shroud of Secrecy, comes out in April. Find out more in our new video promo below. Who organizes Adventures in Odyssey behind-the-scenes? The AIO Coordinator of course. On this edition of the Official Podcast, hosts Bob and Jessie interview Jennifer about how voice acting differs from all other forms of acting, her background working in theater, running a camp for kids in foster care, and participating in the Dixie Stampede. She also talks about monitoring comments on the AIO Club, working with agents, scheduling the actors, the reputation the show has, the benefits of recording "family style," her coffee habits, her spiritual growth, and more. Check out the podcast interview.